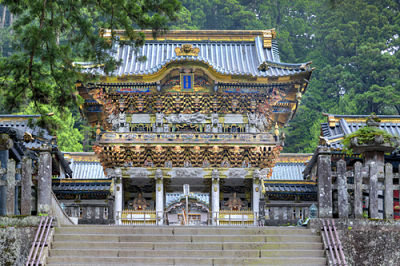 Nikko is one of the most popular tourist attractions in Japan because of its splendid shrines and temples. It was a sacred site in the 8th century and the first Shogun's mausoleum was placed there in 1617. From that time his descendants built evermore elaborate shrines to the Shogunate. For three centuries the Shoguns ruled Japan. The grandeur of Nikko was intended to inspire awe and impress the visitor with the power and wealth of the Tokugawa clan. As it did so long age the Shrines of Nikko still inspire awe in the visitor. The city of Nikko lies at the foot of Mt. Nyoho and is renowned worldwide for the architectural facilities of Toshogu and Futarasan Shrines and Rinnoji Temple, each set gemlike in a perfect natural setting. These treasures are easily located within a 30 minute walk of Nikko Station. A 15 minute walk along Nikko Street will bring you to the lacquered Shinkyo (Sacred Bridge) which spans 28 metres across the Daiya River. Three minutes away is the famous and historic Rinnoji Temple, used to receive princes from the Imperial family as priests during the Kamakura Period (1192-1333). Continue walking for another 4 minutes to the Toshogo Shrine where you will find a synthesis of Buddhist and Shinto architecture featuring an impressive five-story pagoda. The Futarasan Jinja Shrine is the next stop and is said to bring happiness and marriage for those who visit. Legend has it that the Futara-Reisen, the sacred fountain there, has water that restores youth. 97 metres in height, is one of Japan's finest waterfalls (originating from Lake Chuzenji). Descend 100 metres by elevator through the bedrock to the lookout point at the base of the gorge to see the falls plummeting downward. It is especially beautiful in early May for its cherry blossoms and in October for its brilliant crimson foliage. The water is a beautiful indigo blue. To enjoy more of the lake's scenery a 50 minute sightseeing cruise is highly recommended. Regular boat service on the lake connects Fune-No-Eki with Shobugahama in 20 minutes. The service is suspended from December through March. Located on the north-eastern shore of the lake, it is the centre of the Lake Chuzenji area. There are many souvenir shops, restaurants and Japanese-style inn with hot spring baths.